The official Firestone survey is available to customers at www.firestonesurvey.com. It only takes a couple of minutes to fill out. And after you complete the survey, you can enter the Firestone Sweepstakes. In this article, we will describe the steps you need to take to access and complete the Firestone survey. We’ll also explain how you can enter the Firestone Sweepstakes and what the sweepstakes participation requirements are. To participate in the Firestone survey, all you need is a recent Firestone invoice. Your invoice contains a survey access code. The code is 12 digits long and should be somewhere on the bottom of your receipt. Without this code, you cannot access the questionnaire. The survey code is necessary in order to prove that you have recently used Firestone services. Bear in mind that these requirements apply only to the Firestone survey. There is a different set of requirements to enter the Firestone Sweepstakes. We will talk more about these requirements in the following section. All sweepstake participants are required to at least 18 years old. All sweepstake participants need to be legal citizens of the United States. All employees of Bridgestone Retail Operations, LLC (BSRO), its affiliates and retailers (including Firestone Complete Auto Care) are excluded from the Firestone survey sweepstakes. The grand prize of the Firestone survey sweepstakes amounts to $500 and it is awarded once a month. All Firestone client survey sweepstakes winners will be presented with the $500 gift card that they may redeem at one of the company’s auto care stores. 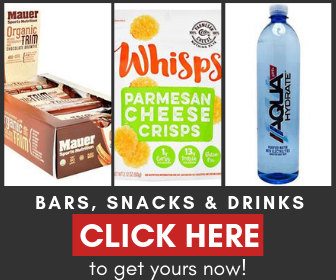 No purchase is necessary to enter the Sweepstakes. And purchasing something from Firestone will not increase your chances of winning. Like we said, in order to enter the Firestone survey, you will need to have a Firestone survey access code. This access code is printed on your Firestone invoice. If you have one, you can proceed with the Firestone survey steps. First, you must go to the Firestone survey website, at www.firestonesurvey.com. On the www.firestonesurvey.com landing page, you will see a blank box. You must write the Firestone survey access code in this box. When you write the code, make sure to include the dash between the number groups as well. Once you’ve written the code and made sure it’s ok, you can click the red button that says “Begin Survey”. You will then have to rate your experience at Firestone, and how satisfied you were with Firestone services. 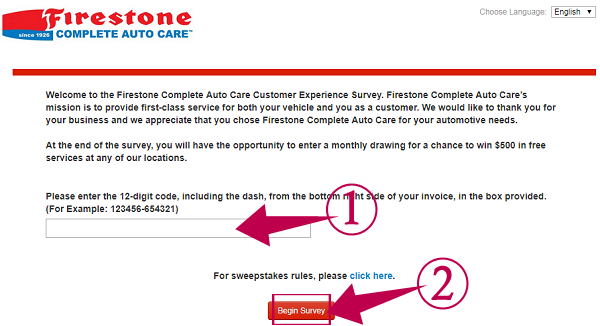 After completing the survey, leave your contact as prompted to enter the Firestone Sweepstakes. These contact details will be used to inform you if you have one the draw. 023361-236080 Every time I have entered I did not get a survey but bombarded with commercials?!?! after another! Just another device to sell product. This network really is an exercise in absurdities!